Roast beef succulent burgers, a juicy rare steak: beef is a bit of a British favourite when it comes to meat eating and we're getting ever more adventurous in our eating habits with more people willing to experiment with new flavours and cooking techniques. Beef is pretty simple to cook really and indeed, a good cut should only need the minimum intervention in terms of flavourings and seasonings as the meat should speak for itself. If you're more used to eating beef than actually cooking it then maybe it's time you tried out some simple techniques for yourself. From choosing your cut to feeling your taste buds tingle as the meat sizzles on the grill, it's a very satisfying experience. Below you'll find some classic ways to cook beef - all very straightforward. You can adapt this recipe to suit your own tastes. For example, you could add some freshly chopped chilli, 1 tsp mustard or some ground spices. Put 450g minced beef, 1 chopped onion, 1 tbsp oil and 2 egg yolks in a large bowl and mix the ingredients together well. Using your hands (yes, it's time to get messy!) divide the mixture into four and shape each one into a burger. 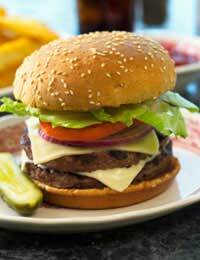 Place the burgers on the grill pan and cook for about 15-17 minutes, until thoroughly cooked through. Turn them halfway during cooking. Serve on burger buns, or in pitta bread, with salsa, mayonnaise, lettuce and tomato. As with a lot of food, the idea of a perfect steak will ultimately come down to personal preference. However, there are certain things you can do to ensure your home-cooked steak is a talking point. First of all you need to pick your cut - sirloin, rump or fillet are safe bets and, if you go to your local butcher, you should be able to get some advice about what's best, and pick out a really nice piece of steak. Preheat the grill to hot (if you have a griddle pan then use this instead and get it nice and hot). Season the steaks with salt and freshly ground black pepper then brush them with a little olive oil. You don't need to put any extra oil on the grill. Place the steak under the grill (or on the griddle) and cook for about 3-4 minutes. Don't be tempted to move or turn it before this, as the heat will seal the meat and stop it sticking to the pan. Turn it over and cook for about the same amount of time on the other side. Keep cooking until it's to your liking. As a basic rule, the more well done you like your steak, the firmer it should feel under the fork or tongs. Serve with a green salad or some thick oven chips. Nothing sums up a Sunday quite like a delicious roast beef lunch. Invite your friends round; buy a nice rib of beef and crack open the red wine. There aren't really any hard and fast rules for cooking roast beef and it really depends on what cut you choose, how big it is and whether you want to add any extra flavourings. It's best to ask your butcher for some advice or, if you bought your meat from a supermarket, follow the instructions on the packaging, as these will explain the oven temperature and timings for specific weights. You should baste the meat with its juices during cooking to keep it nice and moist and always remove it from the oven and allow it to 'rest' for about 15 minutes before carving.